BEST Costa Blanca Markets - WHERE are they, WHEN are they, Which are best? You are here: Home / The Complete Costa Blanca Tourist Guide – By Real People Who Live on the Costa Blanca… / BEST Costa Blanca Markets – WHERE are they, WHEN are they, Which are best? DO YOU WANT TO KNOW WHAT DAYS MARKETS ARE ON? Visiting the local market (or rastro as they are known in Spain) in the town where you live or going on holiday is the way of life on the Costa Blanca and is an experience not to be missed. Each town has a set day of the week for which a market is held every week. If you are holiday you want to get to your local town’s market to experience a taste of Spanish culture. Below we list the various locations and their respective market day of the week. At the local markets you can buy all your fresh produce, from fruits and vegetables in season, fish, meat, cheese, olives, nuts, eggs, clothes, shoes, belts, handbags, kitchen utensils, music cds, carpets, paintings, also items like chillies which are not readily available at the local supermarkets. The produce is of the highest quality and much fresher than at the supermarket. 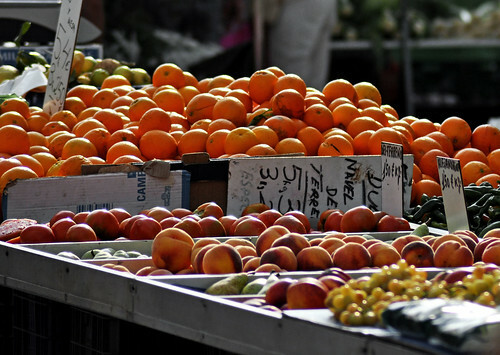 Prices should be cheaper than the local supermarkets so you will see plenty of local Spanish people at the market stocking up on fruit and veg for their weeks cooking. The Sunday markets tend to be rastro markets selling antiques, bric-a-brac and clothes. There are additional rastro markets in Calpe on Wednesday, Benidorm on Friday and Jalon on Saturday. These rastro markets are very popular and busy. Like our boot sales back in the United Kingdom if you wish to sell unwanted items like clothes that are too small, DVDs that you are finished with. You need to arrive by six in the morning, the first shoppers usually arrive between eight and nine in the morning and it costs around €5 for a stand or stall. Can someone please tell me if, and which days there’s a kind of flee market / antiques market in Elche? Starting on the 28th Of October London Antiques carretera Bigastro Orihuela 03300 is holding regular Saturday Antiques & Craft Fairs indoor and outdoor pitches available and the first 4 weeks are FREE for traders. There is a small market starting from near the Centro de Salud , Cabo Roig/Campoamar, on Thursday.